What is the Build Code ? The build code number is not unique to any particular vehicle. It does however relate to a specific date and year, and that date is the day that your car finally left the manufacturers production line. Of course a more "romantic" way of looking at it, is to say that the date to which the build code relates is the day your Coupe was actually born, in other words it's your car's real birthday. The Build Code consists of a four or five digit number (which relates to the date) followed by two more letters and/or digits, which related to the plant of manufacture. 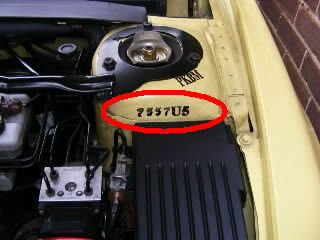 These last two figures may have some relevance for other Peugeot models, but as all 406 Coupes were made at the one Pininfarina factory in Italy, they all have that factory's identification code as their the last two digits which is U5. How is the Build Code calculated ? 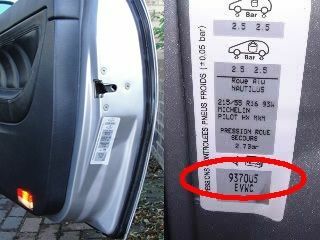 Build Codes / DAM numbers were first allocated to Peugeot vehicles on 1st January 1993. Cars leaving the production line on that date were allocated the Build Code number 5898 (we've no idea why that specific number was chosen.) As each new day on the production line arrived, the Build Code number increased by 1, so vehicles that left the production line on 2nd January were 5899, on the 3rd January were 5900 and so on. Four digit Build Code numbers lasted until 25th March 2004 when number 9999 was reached. Build code number 10000 relates to 26th March 2004 and thereafter the Build Codes are all five digits. Where is my build code?